Each year, 10-14 graduate courses are offered by faculty members in the Department of Chemistry. Available graduate courses will be advertised in August of each year and registration is completed by the Academic Programs Administrator (Mr. Keith Travis) soon after. New students will be added to their courses once they have arrived on campus and met with their Advisor. In total, M.Sc. students take 9 credit hours including CHEM 7900 (above). Students must complete these with a GPA of 3.75 if they want to be considered for transfer into the Ph.D. program. Ph.D. students must complete 6 credit hours beyond the M.Sc. level. If the student has not previously completed CHEM 7900 as a M.Sc. student, they must take this course in addition to the required 6 credit hours. 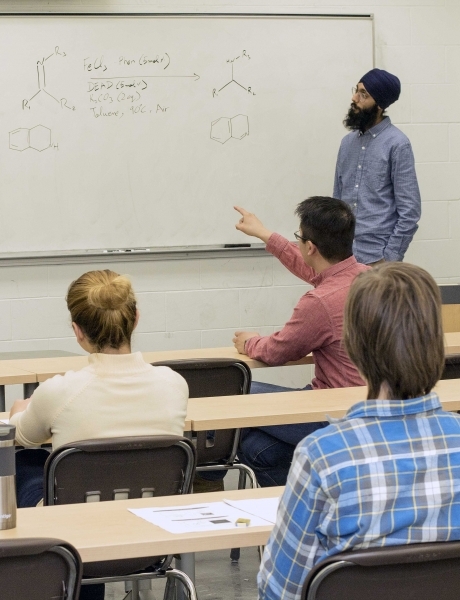 Graduate courses offered in recent terms can be viewed in the Course Catalog by searching under Chemistry for courses numbered from 7000-7999. Graduate courses may be taken from other Departments (Geology, Medical Microbiology, etc.) with approval of your Advisory Committee.